From the flats of the Atacama Desert; steep plains in the Andean foothills and the wet forests of Patagonia, Chile presents its inhabitants with a varied set of challenges when it comes to designing and constructing buildings. Perhaps, it is the diverse topography of his homeland that inspires the work of Smiljan Radić, this year’s Serpentine Gallery architect. Every year the Serpentine Gallery in Kensington Gardens commissions a temporary summer pavilion by a leading architect that has not yet built in the UK. Whilst Radić has constructed very little outside of his home country, his work has already gained international praise due to its versatility and focus on context. So what is it? 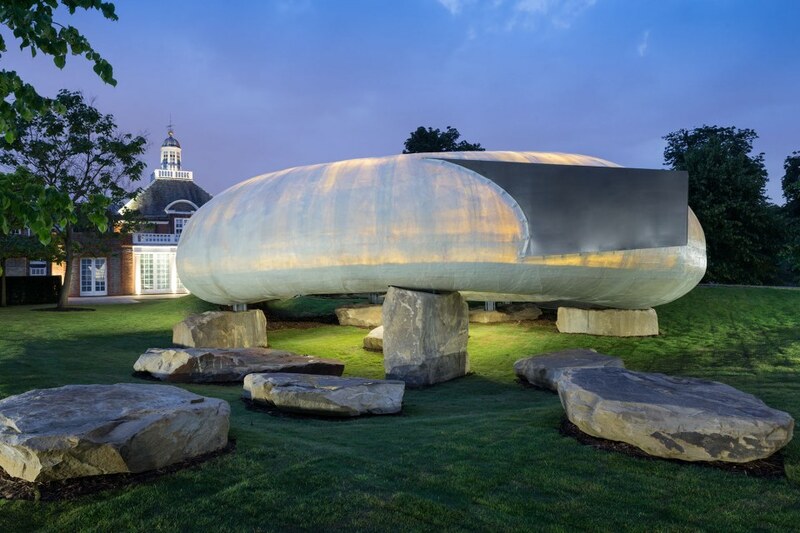 Sitting in 350 square metres on the lawn of the Serpentine Gallery, the pre-opening plans for the Pavilion depict a cylindrical structure, designed to resemble a giant shell resting on large quarry stone. Made from translucent fibreglass, the structure glows after dark attracting curious passers-by to it like moths to a flame. To make the most of its night-time luminescence, from 26th June until 19th October a series of live art, poetry, music, film, literature, performance and theory will take place on selected friday evenings. Should you be planning to visit Chile this year we would certainly recommend visiting some of Radić’s other works. His previous commissions range from public buildings, such as the Civic Neighbourhoods, Concepción, Museo Chileno de Arte Precolombino, Santiago, Restaurant Mestizo, Santiago to small and seemingly fragile buildings, such as the Extension to Charcoal Burner’s House, Santa Rosa, The Wardrobe and the Mattress, Tokyo, Japan, and The Bus Stop Commission, Kumbranch, Austria. Ever considerate of the social conditions, environments and materials with which he works, Smiljan Radić moves freely across boundaries. His versatility enables him to respond to the demands of very different settings, be it the spatial constraints of an urban site or the extreme challenges of remote, rural, mountainous terrain similar to that you will find in his breathtakingly beautiful country. If the magnitude and diversity of Chilean topography and architecture inspires you to create your very own travel story… get in touch.